Rivaroxaban 2.5 mg: For the prevention of atherothrombotic events in adult patients after an Acute Coronary Syndrome (ACS) with elevated cardiac biomarkers (Troponin or CK-MB). Rivaroxaban 10-20 mg: To reduce the risk of stroke and systemic embolism in patients with nonvalvular atrial fibrillation, Deep vein thrombosis (DVT) & pulmonary embolism (PE) and reduction in the risk of recurrence of DVT and of PE , For the prophylaxis of DVT, which may lead to PE in patients undergoing knee or hip replacement surgery. •	Treatment of DVT & PE: 15 mg orally twice daily with food for the first 21 days for the initial treatment of acute DVT or PE. 20 mg once daily with food, for remaining treatment. •	Prophylaxis of DVT following Hip Replacement Surgery: 10 mg orally, once daily with or without food for 35 days. •	Prophylaxis of DVT following Knee Replacement Surgery: 10 mg orally, once daily with or without food for 12 days. 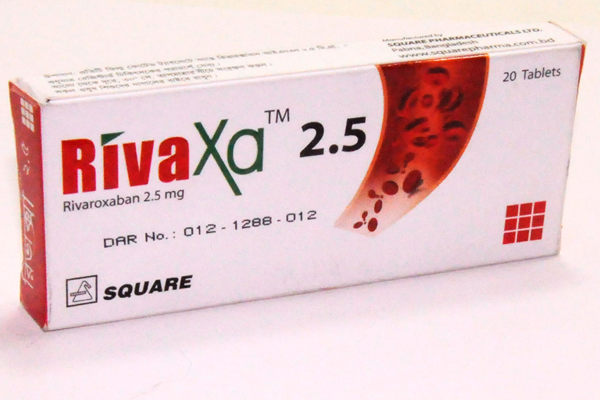 RivaXa™ 2.5 Tablet: Each box contains 20 film coated tablets in blister pack. 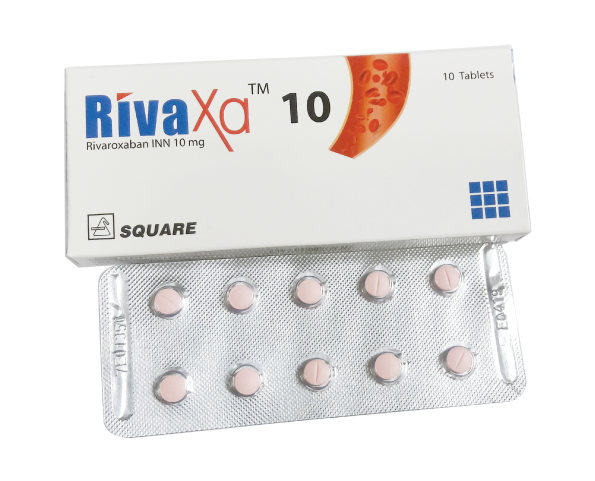 RivaXa™ 10 Tablet: Each box contains 10 film coated tablets in blister pack.